An ultra-Orthodox Jew who stabbed and wounded three marchers in a Jerusalem gay pride parade last summer was sentenced on Wednesday to 12 years in prison after being convicted of attempted murder. Ishai Schlussel told police he was on a mission from God to stop what he described as the abomination of homosexuals and lesbians marching through the holy city, Israeli media reports said. Calling Schlussel a fanatic, the court said in its verdict that he had carried out the attack aware that he might have to pay a heavy personal price for his crime. Authorities in Jerusalem, a city holy to Muslims, Christians and Jews, had tried to ban the parade for fear it could provoke violence, but they were overruled by Israel's High Court. Thousands took part in the procession last June, dancing and waving through the center of the city. At the entrance to Jerusalem, protesters had erected a banner that read "Welcome to Sodom." A spokeswoman for the parade's organizers said the 12-year sentence handed down by the Jerusalem District Court was a victory for freedom of expression and equality for the gay community in Israel. An ultra-Orthodox Jew who stabbed three people during a gay pride parade in Jerusalem last summer was sentenced to 12 years in prison for attempted murder. Yishai Schlisel told police immediately after his arrest that "I have come to kill in the name of God" for what he considered as the abomination of homosexuals and lesbians walking through the streets of the holy city. One man was seriously injured and two women were lightly hurt when Yishai began indiscriminately stabbing marchers in the parade that crossed through the centre of Jerusalem. On Tuesday the Jerusalem district court called Schlisel "a fanatic" after he was convicted last week. 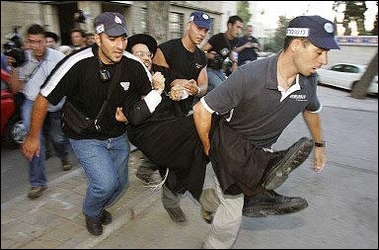 The court also ordered Schlisel to pay 150,000 Israeli shekels (30,000 US dollars) compensation to the victims. 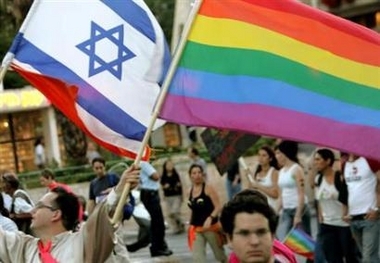 The holding of the gay pride parade in Jerusalem sparked fierce controversy in Israel. Jerusalem's municipality, headed by ultra-Orthodox mayor Uri Lupoliansky, initially refused to authorize the parade, terming it a "provocation." It was forced to backtrack after the event received clearance from the supreme court. In 1988, Israel lawmakers recognized the rights of gay couples, despite the opposition of religious camps in the country.